Practice Data Structure questions and answers for interviews, campus placements, online tests, aptitude tests, quizzes and competitive exams. This set of Data Structures & Algorithms Multiple Choice Questions & Answers (MCQs) focuses on “2-3 Tree”. Explanation: The 2-3 trees is a balanced tree. It is a specific form the B – tree. 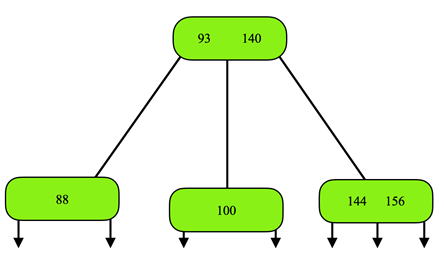 It is B – tree of order 3, where every node can have two child subtrees and one key or 3 child subtrees and two keys. 2. Which of the following is the 2-3 tree? 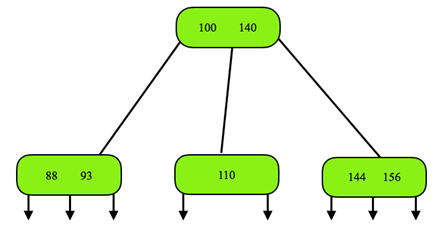 Explanation: Tree should have two subtrees at node2, but it should not have three elements. 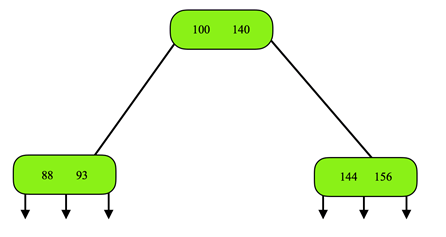 The node with elements 11 and 15 should have three child subtrees. Explanation: The number of elements in a 2-3 tree with height h is between 2h – 1 and 3h – 1. Therefore, the 2-3 tree with n elements will have the height between log3(n + 1) and log2(n + 1). 4. Which of the following the BST is isometric with the 2-3 tree? Explanation: AA tree is isometric of the 2-3 trees. In an AA tree, we store each node a level, which is the height of the corresponding 2-3 tree node. So, we can convert a 2-3 tree to an AA tree. 5. The figure shown below is a 2-3 tree. What is the result of deleting 110 from the tree? 6. Which of the following data structure can provide efficient searching of the elements? Explanation: The average case time for lookup in a binary search tree, treap and 2-3 tree is O(log n) and in unordered lists it is O(n). But in the worst case, only the 2-3 trees perform lookup efficiently as it takes O(log n), while others take O(n). 7. LLRB maintains 1-1 correspondence with 2–3 trees. Explanation: LLRB (Left Leaning Red Black tree)is the data structure which is used to implement the 2-3 tree with very basic code. 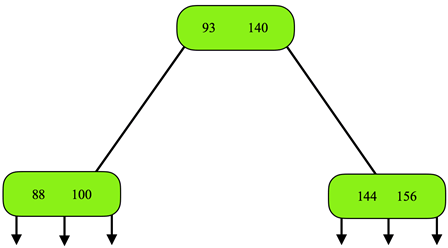 The LLRB is like the 2-3 tree where each node has one key and two links. In LLRB the 3-node is implemented as two 2-nodes connected by the red link that leans left. Thus, LLRB maintains 1-1 correspondence with 2–3 tree. 8. Which of the following is not true about the 2-3 tree? Explanation: In a 2-3 tree, leaves are at the same level. And 2-3 trees are perfectly balanced as every path from root node to the null link is of equal length. 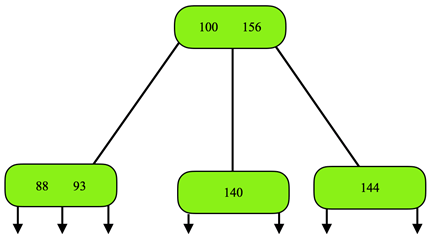 In 2-3 tree in-order traversal yields elements in sorted order. 9. AVL trees provide better insertion the 2-3 trees. Explanation: Insertion in AVL tree and 2-3 tree requires searching for proper position for insertion and transformations for balancing the tree. In both, the trees searching takes O(log n) time, but rebalancing in AVL tree takes O(log n), while the 2-3 tree takes O(1). So, 2-3 tree provides better insertions. 10. Which of the following is false? Explanation: Search is more efficient in the 2-3 tree than in BST. 2-3 tree is a balanced tree and performs efficient insertion and deletion and it is shallower than BST. But, 2-3 tree requires more storage than the BST. 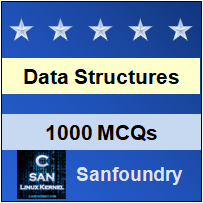 Sanfoundry Global Education & Learning Series – Data Structure. To practice all areas of Data Structure, here is complete set of 1000+ Multiple Choice Questions and Answers.